Boat riding, snorkeling, fishing, diving, suntan etc. Best Time To Visit : All year round. Arrive Male and transfer to your island resort by speedboat. Dinner and overnight. Breakfast. Day free to explore the island beach resort. Dinner and overnight. Breakfast. Explore any one of the beautiful islands on your own. Breakfast. Day free to enjoy water sports or just laze around and enjoy the scenic beauty of the beaches. Bandos, on North Male Atoll, is a 15 minute speedboat ride or a one hour boatride from the Male International Airport. It is amongst the most well established and biggest resorts in Maldives. It has excellent beaches and its sister island Kuda Bandos is easily accessible by boat. Amenities include AC rooms, IDD telephone, fresh water swimming pool, sauna, discotheque, massage parlour, beauty salon, gym, childcare center, medical clinic, souvenir shops, fully equipped business centre with secretarial service, conference facilities, convention center, laundry, safes/lockers, satellite TV/TV room and 3 bars. 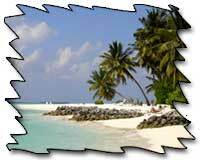 Full Moon Beach is located in North Male Atoll. A 20-minute journey by speedboat takes you to this beautiful resort. The island is covered with lush vegetation. A laid back philosophy, friendly staff with a high commitment to serve, assures a hassle-free holiday without jeopardizing those small luxuries you are used to. Amenities include AC, in-room direct phone service, mini bar, balcony, safe deposit box, restaurant, lounge, coffee shop, 24 hours roomservice, heated pool, jacuzzi, sauna, meeting facilities, laundry, medical centre. This resort is situated in the heart of the Maldives on South Malé Atoll. This tropical hideaway is amongst the most favored islands for those visiting Maldives to enjoy the natural beauty of the tropics. Kandooma has all the modern facilities and themanagement ensures that the holiday atmosphere lasts forever. Kandooma is one of the most popular resorts in the Maldives for divers, due to the island’s strategic location. Room are equipped with air conditioning, colour television with cable, IDD telephone. Facilities include laundry, shops, fitness room, swimming pool, spa, bar, restaurant, night club, coffee shop, 24 hours room-service. Kuredu, on Lhaviyani Atoll is famous for its abundant fish life. A paradise with more than 3 km of white beaches and aquamarine lagoons, Kuredu is 40 minutes away by seaplane or 4 hours by speed boat from the airport. Exotic, thatched bungalows andspacious villas line the white sand beach, while Sangu Sunset Water Villas are built on columns over the lagoon. Facilities include AC, fridge, mini bar, terrace with sun chairs, a swimming pool and children's pool surrounded by a magnificent wooden deck, TV room with library, excursions, water and land sports, shows, discos, games and beach parties. Located on North Male Atoll, 10 minutes by speedboat from Male. Rooms are equipped with a mini bar, coffee and tea making facility, in–house safe, music and IDD telephone. Facilities include a swimming pool, therapy centre, foreign exchange, laundry, medical assistance and travel desk, daily entertainment, fishing, boating, tennis court, health club, windsurfing, catamaran sailing and glass bottom boat rides. This popular resort is located on North Male Atoll, 40 minutes by motorboat from Male. Rooms are beach facing and have private facilities, telephone, private verandah. Superior rooms have air conditioning and private garden. Facilities include swimming pool, indoor sports, TV lounge, reading lounge, souvenir shop, discotheque, karaoke lounge, fishing, windsurfing, catamaran sailing, water skiing, diving, steam and sauna, gymnasium, snooker, soccer, banana boat riding, snorkelling and table tennis.